Don’t laugh. The Lib Dems are the only party that today seems capable of gaining seats from the Conservatives, especially in London, Cornwall and southwestern England. Pro-Remain voters, who swung to the Tories in 2015, seem likely to swing back to the Lib Dems over Brexit. Even a mediocre Lib Dem campaign could expect to achieve this. Tories gained 27 seats from the Lib Dems two years ago, many in constituencies (like Solihull and Bath, for example) that are essentially two-way contests, where Labour support is negligible. The by-election signs are as encouraging for the Lib Dems as they are ominous for Labour. Zac Goldsmith, previously the Conservative candidate for London mayor, resigned his seat representing Richmond Park in London, in protest to the Tory proposal for a third Heathrow runway. In the ensuing by-election last October, Goldsmith, running as an ‘independent,’ lost the race by 4.5% to Sarah Olney, an anti-Brexit Liberal Democrat. Polls currently give the Lib Dems just 11% or 12% support today, but that’s still an improvement on the 8.1% the Lib Dems won in 2015, when voters punished then-leader Nick Clegg for joining a coalition five years earlier that made Conservative leader David Cameron prime minister and his subsequent reversal on increasing student fees. Of course, 12% support falls far shorter than the 22.0% the Lib Dems won in 2005 and the 23.0% in 2010. Despite the ‘Cleggmania’ sensation that swept the final weeks of the 2010 election, it’s worth noting that the Lib Dems actually won more seats (62) under the leaderhsip of the late Charles Kennedy in 2005, on the strength of the party’s opposition to the Blair-led war in Iraq. As the impact of the Cameron coalition government fades, there’s every expectation that the Lib Dems can return to their pre-coalition levels of support. The party’s new leader, Tim Farron, hasn’t exactly shown the same kind of charm as former leaders like Clegg, Kennedy or Paddy Ashdown. Elected to the leadership in July 2015 after the party’s parliamentary caucus was slashed from 57 to just eight, Farron comes from the relatively left-wing side of the party, having narrowly defeated the more center-right Norman Lamb. Farron’s religious views make him personally more socially conservative (for example, on LGBT rights) than many of his party’s supporters, and he has no ministerial experience. This will be Farron’s first general election as party leader (also true for May and Corbyn), and many British voters are unfamiliar with Farron and his views. In a world where voters increasingly prefer outsiders to experienced politicians, however, that may be to Farron’s benefit. Farron has one thing going for him. Unlike May, an anti-Brexit Tory who stood on the sidelines for much of the Brexit referendum campaign last year, and Corbyn, who did little to bolster the cross-party Remain campaign and who once favored leaving the European Union, Farron is a staunch europhile who stood against Brexit from the beginning. In March, as Labour MPs waffled in disarray, the Lib Dems joined the SNP in voting against triggering Article 50. Farron wants to wage a general election campaign not to reverse Brexit, necessarily, but against a ‘hard’ Brexit that would leave the United Kingdom outside the common market. Even if May emerges with an enhanced majority, a strong showing for Farron’s Lib Dems might encourage a softer Brexit. There’s huge potential for the Lib Dems to become the vehicle through which many of the British electorate’s pro-European voters choose to express that sentiment — at a time when Corbyn’s leadership has significantly lowered the costs for traditional Labour voters to defect in 2017. Moreover, Farron will be leading a core team that will include not only Clegg, who is standing for reelection in Sheffield Hallam, but Vincent Cable, the popular former business secretary, who has already pledged to run in Twickenham for the seat he lost (by a narrow 3.3% margin) in the 2015 election. Simon Hughes, the former minister of state for justice and deputy Lib Dem leader, who lost his seat in London’s Bermondsey and Old Southwark constituency in 2015, is also running. As will Ed Davey, former secretary of state for energy and climate change, who will challenge for his old seat in Kingston and Surbiton, another London constituency. Other former Lib Dems, like Danny Alexander, Jo Swinson and David Laws, may follow their lead. Ironically, Farron’s team will likely have more experience on government frontbenches than anyone in Corbyn’s shadow cabinet, a motley crew of has-beens and never-weres. Farron should aim even higher for 2017. Brexit and Labour’s ideological shift (and internal divisions) give him a once-in-a-generation opportunity to reshape British politics in a landscape that’s already under considerable strain. In this moment, the unlikely and untested Farron holds an opportunity, however slim, to bring together pro-European Tories, skittish business leaders and moderate Labour supporters who fear Corbynism nearly as much as the Tories. Many old Labourites remember the disastrous alliance of the old Liberal Party with the breakaway centrist Social Democratic Party of the 1980s, a group of centrist Labour figures who opposed Michael Foot’s left-wing leadership. That alliance in 1988 formally merged to create the current iteration of the Liberal Democrats. Despite the support of former Labour heavy-hitters like Roy Jenkins and David Owen, the Liberal-SDP alliance never mortally wounded Labour, even as Labour lost election after election. If anything, the effort divided Margaret Thatcher’s opposition into warring camps, virtually guaranteeing Tory hegemony in the 1980s. But that was nearly more than three decades ago. Corbynism, Brexit and the Scottish independence movement have in the 2010s undermined the traditional two-party system in ways that no one would have imagined even a quarter-century ago. In the last election, seven party leaders were invited to the general election debates. (May has already ruled out appearing in any TV debates in 2017, a decision she may come to regret). Farron may find some sympathetic figures on both the left and the right. They include longtime pro-European Tories like former chancellor Kenneth Clarke, who voted against Article 50 in parliament (an MP since 1970, he might well not seek reelection) and former Cameron-era chancellor George Osborne, a bitter May rival who recently announced he would take over as the editor of the London Evening Standard. In his heart of hearts, certainly former prime minister Tony Blair and many of the leading figures of the New Labour would prefer Farron to Corbyn. For lots of reasons, you shouldn’t expect them to sever ties to their parties. Nor would their formal support do much to help to Farron. Blair is so toxic, personally, that a formal endorsement would probably lose Farron some voters. That shouldn’t stop Farron from reaching out to all of those centrist Labour voters who delivered three electoral mandates in a row to Blair in the 1990s and 2000s or to those Tories who fear that May is unable or unwilling to avert a disastrous rupture with the European Union that could prove ruinous to British business and trade. Many voters, already exhausted by an existential Scottish referendum in 2014, a brutal general election in 2015 and the divisive Brexit referendum in 2016, despair both at the notion of putting Corbyn in 10 Downing Street or handing May a 100-seat Tory majority. There’s a wide pool of anti-Brexit and centrist voters who will be looking for a genuine national alternative to both May and Corbyn. It would be a tall order for even more experienced and charismatic LibDem leaders like Ashdown or Clegg in their primes, but it’s not impossible that the Lib Dems could scrap their way to become the official opposition (not unlike the New Democratic Party in Canada between 2011 an 2015). 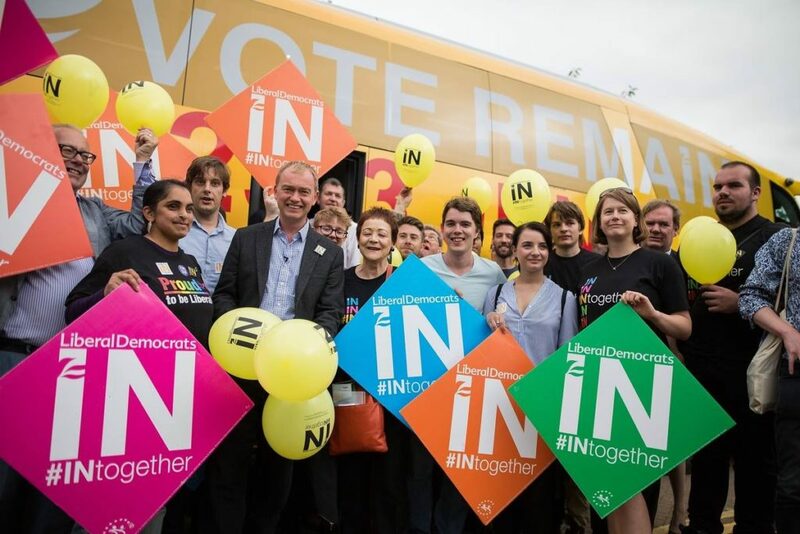 Farron might even consider dropping the ‘Democrats’ from the party name and run on the proud Liberal tradition of the 19th and 20th century — a country that embraces both the economic prudence of Gladstone and the social conscience of Asquith, with Lloyd George’s commitment to a British nation integrated with a free, peaceful and democratic Europe. There’s a lot to mine here, and of course, the Liberals provided a home to Churchill in his early days. With enough luck and with steady vision, the Liberal Democrats should seize 2017 as their moment. But it’s a steep climb, and Farron hasn’t yet shown he’s capable of that leap. We’ll know in 51 days.